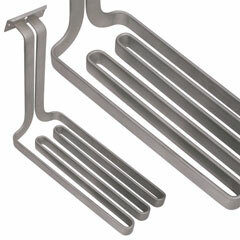 FIREBAR® heating elements provide added heating performance over standard round tubular heating elements—especially for immersion applications in petroleum-based liquids requiring high kilowatts. FINBAR™ is a special version of the one inch, single-ended FIREBAR. FINBAR is specially modified with fins to further increase surface area for air and gas heating applications.